It’s one of those things you never think about until it’s too late: cemetery management. Often, clients don’t see the need for it until it’s a problem: a plot sold that is not available, a record that needs to be found, or an error that’s been discovered. These mishaps can be tragic for those who assume their family’s generations-worth of plot records will be properly managed and recorded. Poor plot management plagues the cemetery industry. Cash-strapped agencies with mismanaged funds have led to a litany of instances regarding incorrect or incomplete recordkeeping, making sacred ground more akin to a battleground. And, if that weren’t enough, these issues are not usually addressed until long after a problem is discovered. But Black Mountain Software can reduce the likelihood of something like that happening with our Cemetery Management Software. 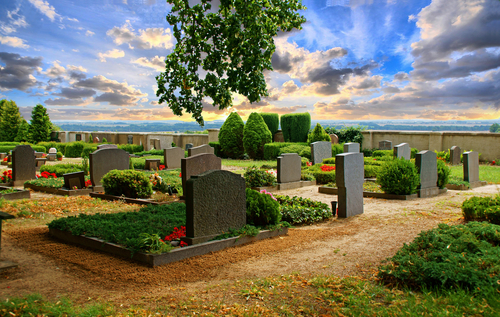 With our software, cemeteries are easily managed with GIS information, which can be exported to a mapping program, and simple report creation. Large or small, each cemetery will be given a number of tools to help manage, maintain and find customer records with ease and accuracy. Our system records everything necessary when it comes to organizing a cemetery: from physical plot location to plot owner, occupant, and genealogical information, all of which can be accessed with ease according to cemetery/section/block/lot information and owner names. Don’t wait until it’s too late! Burying your head in the sand will only exacerbate the potential for disaster and add to the years of compromised paper records. This entry was posted in Best Practices, BMS Products, BMS Tech Tips, Latest News, Office Efficiency, Small Cities, Technology, Uncategorized. Bookmark the permalink. Follow any comments here with the RSS feed for this post. Post a comment or leave a trackback: Trackback URL.